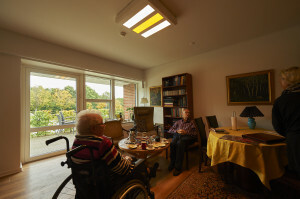 Chroma Zenit Circadian Lighting is to help the elderly get more energy, eat and sleep well at Sønderskovhus. The light is customised to the needs of the users – and supports the natural circadian rhythm of the residents as well as the staff. 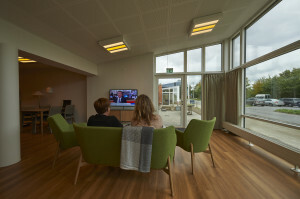 In connection with the renovation of the assisted living facilities of the nursing home Lokalcenter Sønderskovhus, a total of 12 assisted living facilities, dining room, living room and several activity rooms have been equipped with Chroma Zenit Circadian Lighting. “The light is to provide the residents with all the light they need during the day in order for them to sleep well at night. It gives them a normal circadian rhythm. 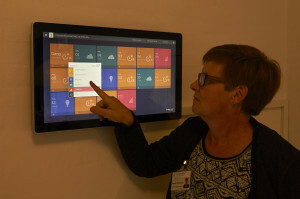 I am very inspired by the potential of the new light, and I am happy that it is adapted to the rhythm of our residents”, says manager of the assisted living facilities at Sønderskovhus, Conny F. Christensen. Chroma Zenit Circadian Lighting is an automatically controlled light. It is based on a clinically validated light protocol and follows a fixed rhythm around the clock in order to ensure a good circadian rhythm. Furthermore, the light includes several light settings that are adapted to the various activities of the nursing home. ”We have been provided with a light that suits the needs of our residents. We can choose between two circadian rhythms – either A or B. 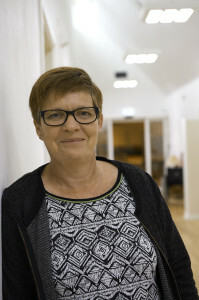 The reason for this is that several of our residents wish to sleep in and need the additional sleep”, explains Conny F. Christensen. The assisted living facilities are home to singles and married couples and several with dementia. In cooperation with the lighting experts of Chromaviso, the staff has developed the light settings Cosy and Activity. ”The possibility of using the light to support the well-being of the residents is very interesting. Some residents are passive, and here, we turn on our Activity light in order to make them more active. For example before meals, making them want to eat more. However, we can use our Cosy light to get the residents to calm down and let go of anxiety and restlessness. We can calm down the ones on the way into delirium”, explains Conny F. Christensen. Precisely the relaxing Cosy light creates almost immediate calm in a room. ”I was with a resident who was very upset. I turned her away from the window and the light from outside, and turned on the Cosy light instead. She immediately calmed down”, says social and health care assistant Bjørk Dãnjalsdottier, who also feels the effect of the light on her own body. The staff also changes behaviour with the new light. ”When we lower the light to Cosy light, we also automatically lower our voices and we calm more down ourselves”, says Conny F. Christensen. The operation has been specially designed by Chromaviso to be user-friendly and fit into the homely surroundings. 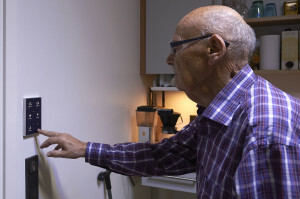 In all assisted living facilities, there are push button panels, and the residents have taken the new lighting to heart. ”The new light is exciting. It is pleasant and easy to figure out”, says resident Erik Andersen. Furthermore, the staff can get an overview of the lighting in all rooms through a centralised touch screen in the office. From here, they can also control the light and anticipate emergency situations. ”We turn on the full light before responding to an alarm. This gives the resident a sense of security in knowing that we have heard them and are on our way”, says Conny F. Christensen. The light is custommade to fit the udsers need, and the work flow before, during and after procedure. You operate the light on the specially designed Chromaviso panel.